1. Cream together the butter and sugars in a mixer. 2. Add the eggs and vanilla to the mixture. 3. Then, add the flour, salt, baking soda, and baking powder. Mix on low until combined. 4. Fold in the chocolate chips and refrigerate the dough while you set up the s'more ingredients. 5. 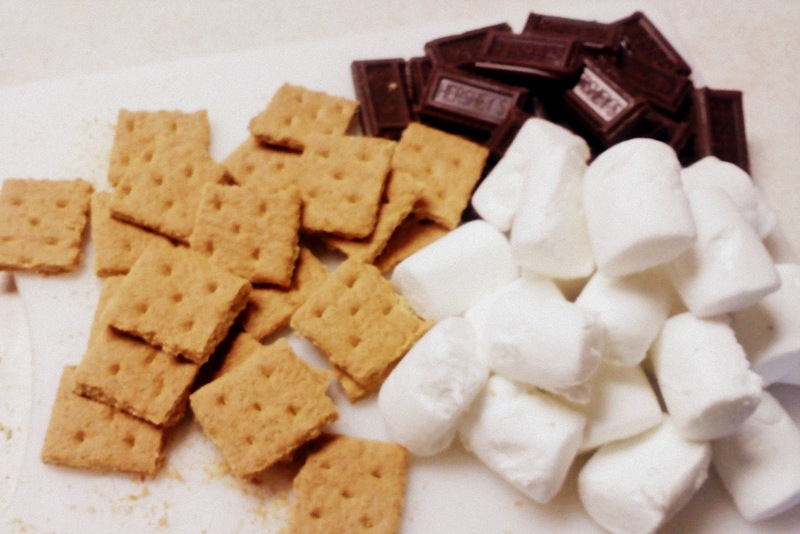 Chop the graham crackers into small squares. I break them into their long strips and then cut them in half again. Break the chocolate bars into the small blocks of chocolate. Cut the marshmallows into fourths. 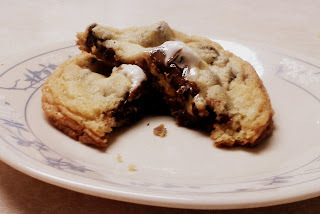 I made some with 1/2 a marshmallow and there was too much marshmallow and it bubbled out of the cookie. So, either cut your marshmallow in half twice or use mini marshmallows. I stacked them together before I got the dough out so they would be ready. You should have graham cracker on the bottom, then chocolate, then marshmallow all lined up and ready. 6. 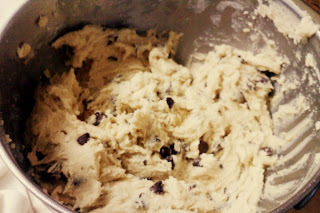 Scoop out two teaspoonfuls of your dough. 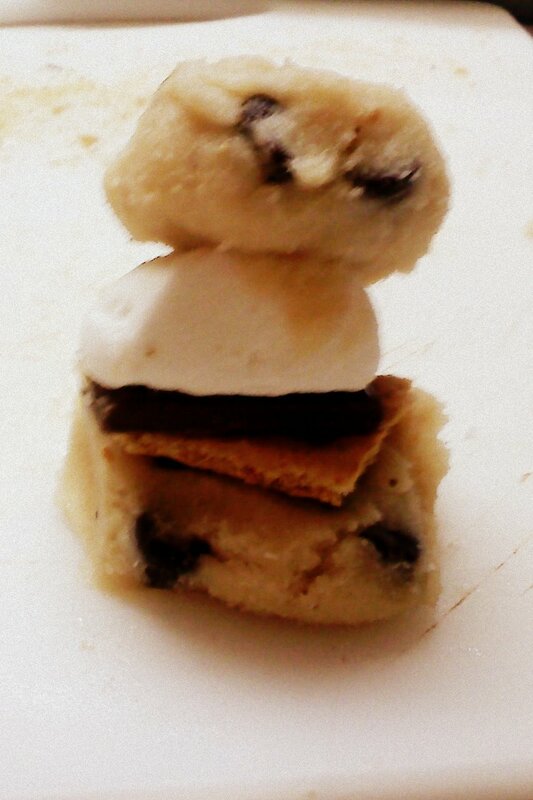 Put one on top and one on the bottom of your S'more stack. Then, add another scoop to the sides. I squished down the top and then added in the extra dough were it was needed. Once your dough is added, roll it lightly in your hand to make a ball. Then, set your s'morekie onto a parchment paper lined baking sheet. I fit 6 on a sheet. 7. Bake for 10-15 minutes, until golden brown. The marshmallow still oozed out of the top of the cookies so, they are not the prettiest cookie ever but man do they taste wonderful. 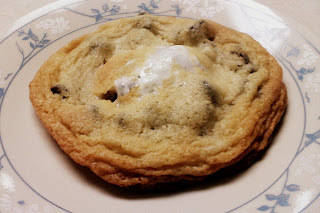 Now that I've made S'morekies and Pillow Cookies (stuffed with brownie), do you have any other suggestions to stuff cookies with? I have to try those. They look so delicious! Please do and tell me how they turn out! Oh, these look SO yummy! We are going to a neighborhood BBQ tomorrow night and were going to bring chocolate chip cookies. Think we will try these instead. Yum! uuuuhhh this look so yummy! I love stuffed cookies as well. This ones look delicious! have a nice day =)! Thats perfect! I love making them. What is your favorite sweet? Those look delicious! Stopping by from SITS Saturday Sharefest! Very clever and can't wait to try these! Visiting from SITS! They look Delish! Pinning and must try! These look so yummy, and my kids would go crazy for them. I will definitely be trying! Happy SITS day to you!